The Board of the St. Albert Rotary Music Festival is pleased to announce that Mr. Michael Massey has lent his support to our Festival. 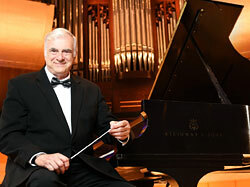 We are privileged to have a musician, composer, conductor, and leader of his stature associated with our Festival. View the highlight sheet of 2019 AMFA Syllabus changes. Dance classes will NOT be offered at Festival 2019. The Fee Schedule has been updated for 2019. We have streamlined the schedule – there are no longer any discounts for participants registering in more than one solo class. However, fees have not been increased for 2019. We are pleased to be able to offer Fiddle and Ukulele classes this year! Fiddle classes will be held at Red Willow Community Church the evening of Thursday, April 4, 2019. Ukulele classes will be held at the St. Albert Lutheran Church on Saturday, April 6, 2019. Please refer to the Local Syllabus for class details and criteria. At the Fall 2018 AMFA AGM, which I and our President, Darel Baker attended, AMFA and its member festivals voted to withdraw our membership from the Federation of Canadian Music Festivals (FCMF). View the letter of explanation from AMFA. During the past couple of years AMFA and its 37-member festivals (including us) have participated in significant discussion and research around copyright as it pertains to music and the performance arts. I share with you a brief summary of what we have learned. Please familiarize yourself with your legal obligations as performers. If you would like to allocate funds to named or unnamed scholarship(s) or awards(s), please send an email to info@st-albertmusicfestival.ca and specify your preferences or indicate your preferences under "Add special instructions to the seller" when making a payment through PayPal. Thank you.